I made these little cakelets over the weekend and they turned out creamy dreamy, light, almost “fluffy” even, sweet, and so pretty to serve — these little raw white chocolate cakes are just ♡. 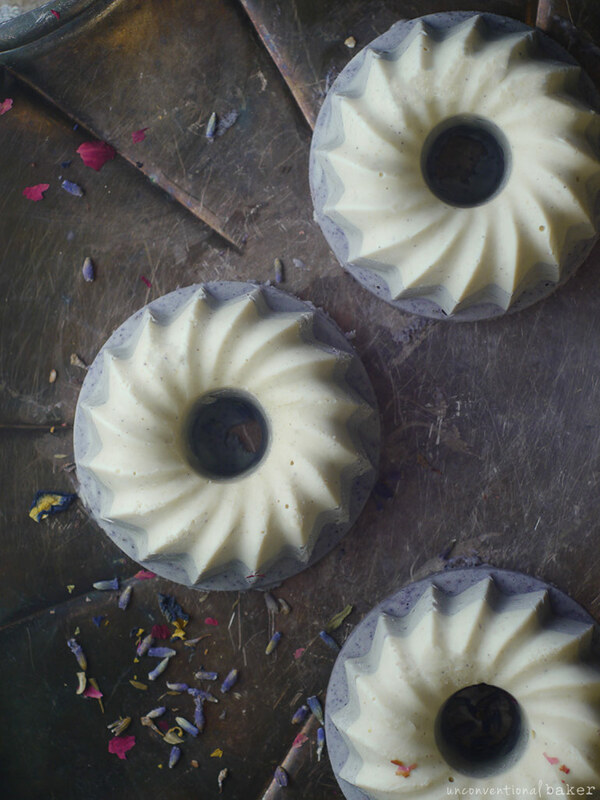 Of course a key player in the “pretty factor” here are the cute silicone bundt pan molds. 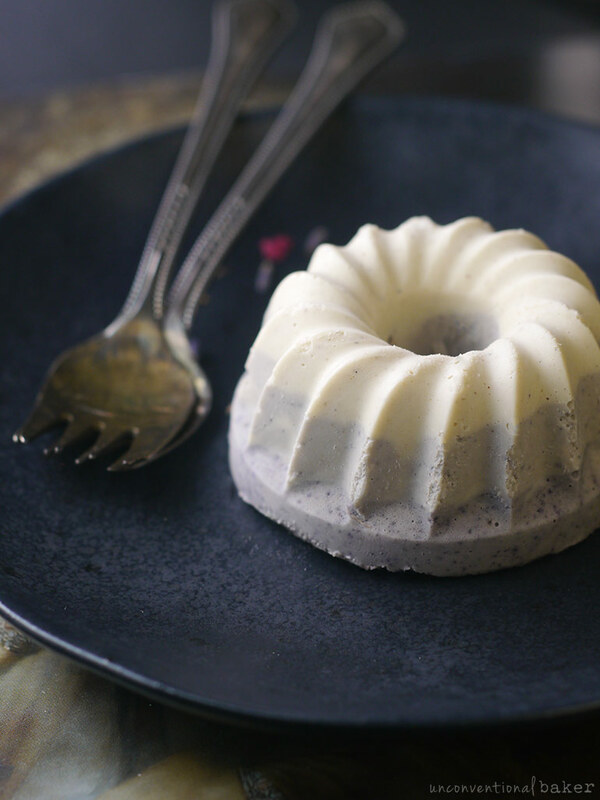 They make the loveliest tiny cakes, but speaking of extra things, if you’re not in the mood for yet another mold just to make a dessert, you can just make this treat in some silicone muffin liners, or even add a little crust and make this in a 6″ springform pan. But then again, it’s hard to resist mini bundts, isn’t it? :) They make for pretty cakes to share with others. 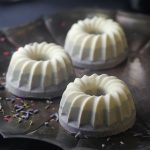 Sidenote on this subject: one thing to keep in mind if you choose to go the mini bundt route is to carefully unmold the cakes when they are fully frozen. Also don’t fill them to the brim. Otherwise you might struggle to loosen them out of this type of a pan gracefully. These cakelets however are extra delicious served with fresh blueberries — a lovely way pairing with the creamy chocolate base. You can fill just the center with some fresh blueberries prior to serving. Another beautiful thing about these cakes is the possibility of accenting it with some lavender…because chocolate + lavender + blueberries is an incredible combo. Alas, I made these for company where someone is really anti-lavender (shocking, I know)! I still managed to sneak in some at a very low dose, but my personal preference is to up that flavor. I recommend starting with somewhere between ¼ – ½ tsp of the flowers for starters and see how you go. 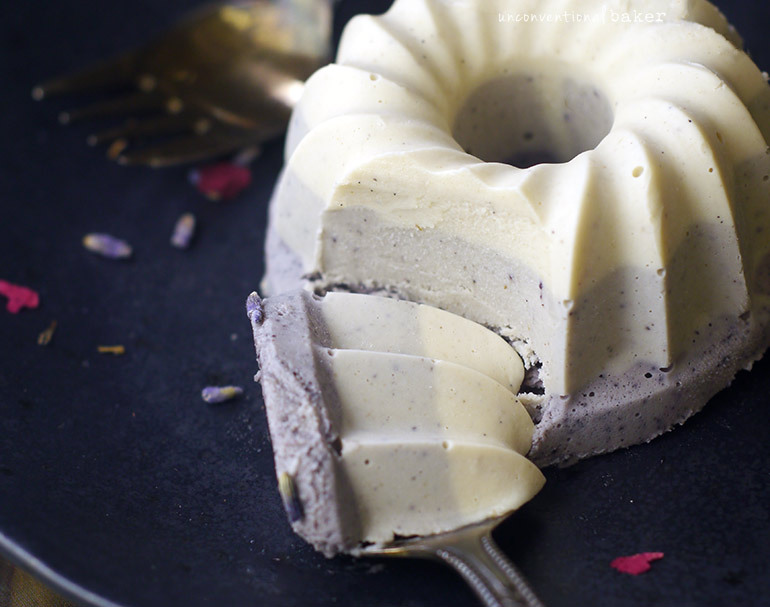 These vegan white chocolate cakes are creamy, light, sweet, and make for a pretty treat to serve. Optional: they are lovely when accented with lavender and served filled with fresh blueberries. 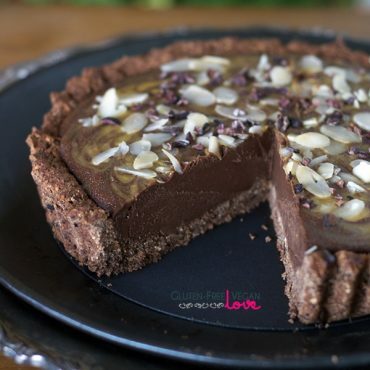 This recipe is gluten-free, paleo, refined sugar-free, coconut-free, and can easily be made raw. 1. Make sure all ingredients are at room temperature before getting started. Blend all white layer ingredients together in a power blender until completely smooth. Place a silicone mini bundt pan (or some silicone muffin liners, etc.) onto a metal tray. Divide a third of the white mixture between the 6 cavities (either pipe it in through a piping bag, or just carefully spoon it in). Tap the tray down on the counter to flatten the mixture in the pan and release excess air bubbles. Place in the freezer (tray and bundt pan together) for 15-20 mins to set. 2. Add in the blueberry powder for the light gray layer into the remaining mixture in the pan and blend to combine. Carefully spoon (or pipe) half of this mixture over the white mixture in the chilled bundt pan. Tap the tray on the counter again several times to flatten the mixture and release excess air bubbles. Return to the freezer for 15 mins to set. 3. Add more blueberry powder to the remaining mixture in the blender and blend to combine. Carefully spoon (or pipe) this mixture over the light gray mixture in the chilled bundt pan. Tap the tray on the counter again several times to flatten the final layer and release excess air bubbles. Return to the freezer for 5-6 hours or overnight to set. **If you want to keep this recipe strictly raw, use your favorite raw sweetener instead of maple syrup (like raw agave, etc.). 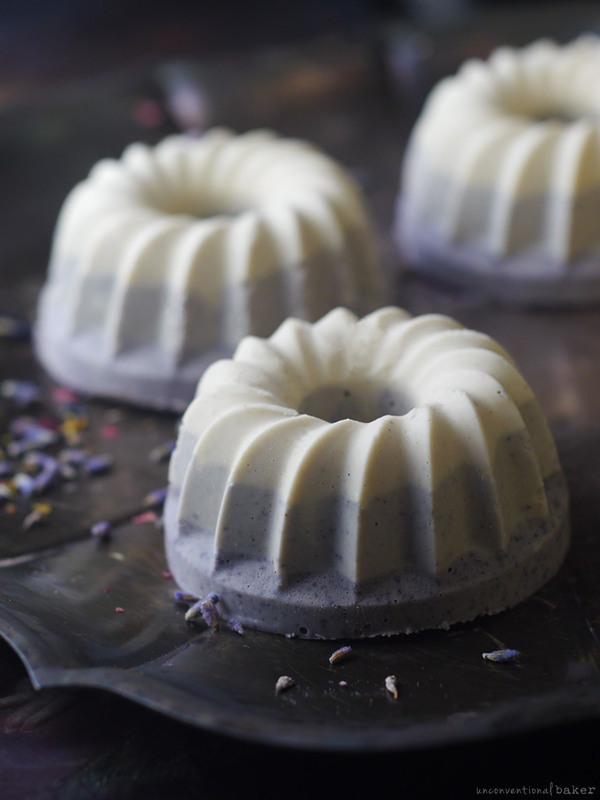 ****Raw ground vanilla plays an important role in terms of flavor in this recipe. But if you can’t source it, use either half of a freshly scraped vanilla bean pod or 1 tsp pure vanilla extract. 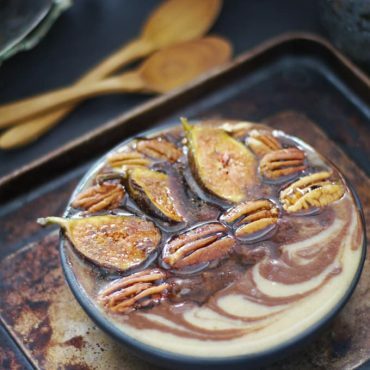 *****Storage notes: treat this dessert like ice cream. It should be kept frozen until serving, and any leftovers should be kept frozen as well. 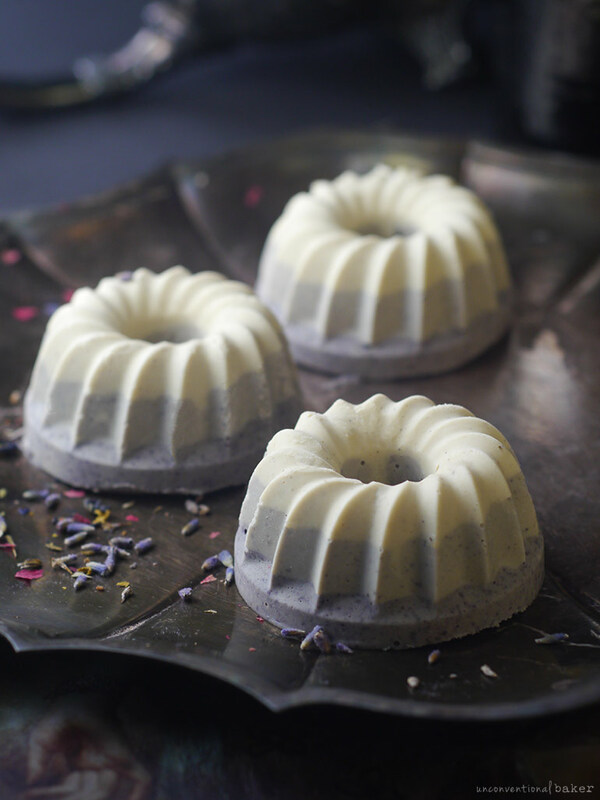 Disclaimer: this recipe contains affiliate links to the following products: raw cashews, maple syrup, cacao butter, salt, raw ground vanilla bean, edible dried lavender, blueberry powder, a power blender, and a silicone mini bundt pan.